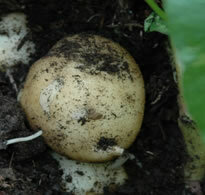 Being a new boy to growing vegetables I was looking for a potato which would be early and suitable for salads. I selected the Rocket potato and it is certainly living up to its name. Planting them at the end of March most of the very cold weather was behind us. Our soil has a clay and sandy content. I mixed seven wheel barrow loads of compost which I had prepared over the winter. 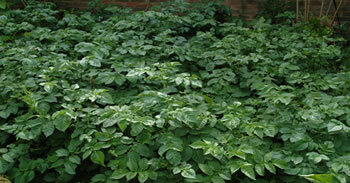 The area I allocated for the potatoes was about 5m by 4m. I planted 3 rows and after a few weeks signs of growth appeared. I heaped up the soil to the plants as they grew. 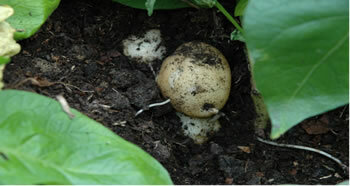 The directions on the packet of seed potatoes indicated they would be ready at the end of June. In the last few weeks the plants just seemed to over run the entire plot as you can see from the photograph. As I was not sure if they were ready to dig up I decided to explore the roots and to my amazement there was a healthy crop ready to harvest. This variety of potatoes clearly live up to their reputation giving a clear waxy texture which makes them very suitable for salads with a white skin and white flesh. Most important their taste is out of this world..
Kind thanks to David Virgo (Sussex) for submitting this article.